When I was younger my collecting habits could easily have been categorized as “hoarding.” I opened anything and everything. I also held onto it all. Nowadays my time is limited. While I will still try to open at least one box of almost everything, my “collect and hold” habits have become quite concentrated. I’ve started Micro Collecting. At least that’s what I call it. Micro Collecting involves finding projects that have personal meaning but can be achieved with a small number of cards. 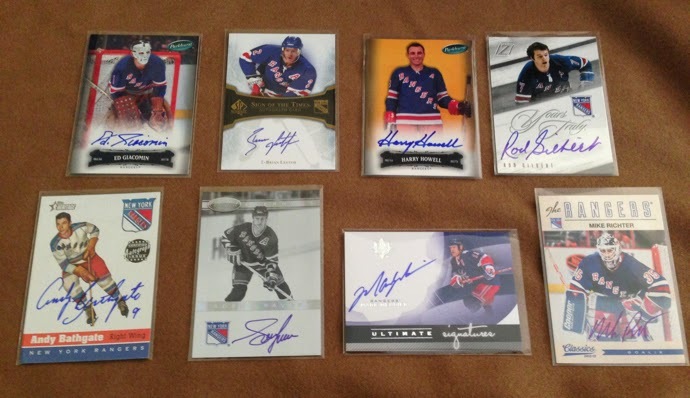 I’ll use my most recently completed Micro Collecting project as an example, all the players on the New York Rangers with numbers that have been retired. This was a great little project because there are only 8 players. It was interesting to put together because the players spanned different eras. The bonus was all these players have certified signed on-card autographs, which is my default favorite to collect. There are many advantages to taking on smaller projects. There is less of a chance of getting discouraged about completing a project. You can be really selective with which cards to go after. You can highly personalize your collecting while at the same time discover some cards you may never have thought to collect. Micro Collecting can also be done with a wide variety of budgets, big and small. The Rangers Retired Numbers project could have been done with rookie cards, cards from their best years, low numbered serial cards, sticker autos, Auto Relic Cards, printing plates, etc. The key to Micro Collecting is picking a subject matter or theme that means something to you. For example, if you were a power hitting catcher in high school, you could Micro Collect catchers with 35 or more home runs in a season. (For the record that would be Javy Lopez, Todd Hundley, Roy Campanella, Mike Piazza, Johnny Bench, Walker Cooper and Ivan Rodriguez while leaving out Gabby Hartnett, a player from the 1930s who has no cards.) Or you can collect players that share your birthday, who attended your college at the same time as you or maybe even players who share your last name. Perhaps collect all the players from your favorite team who have made it to the Pro Bowl. You could assemble the entire team from your favorite championship season, which is my current project. I should have it completed by the end of the year and I’ll share it with you when I’m done. The entire point is to pick an easy project that inspires you. So what inspires you? Feel free to leave a comment and share a Micro Collecting project you are working on, have completed or maybe even something this post has inspired you to pursue. I’d love to hear about it.